PA100V Power Amplifier is a 40W Power Amplifier (Class-D) with output alternatively at 70V or 100V. It has 2 stereo inputs (1x3.5mm jack for line in, 2xRCA for L&R), 1 digital input & 1 balanced MIC. It is integrated with powerful functions, including ducking function, EQ control, MIC mixer etc, and MIC input supports 3 levels with condenser MIC, dynamic MIC & line audio input. Mono audio output at 40Watt. Switchable between 70V and 100V. 16 ID codes for controlling between different PA100V amplifiers. 3-level MIC input, supports condenser microphone, dynamic microphone and wireless microphone. MIC port can support balance/unbalance signal, suppress the external noise effectively. 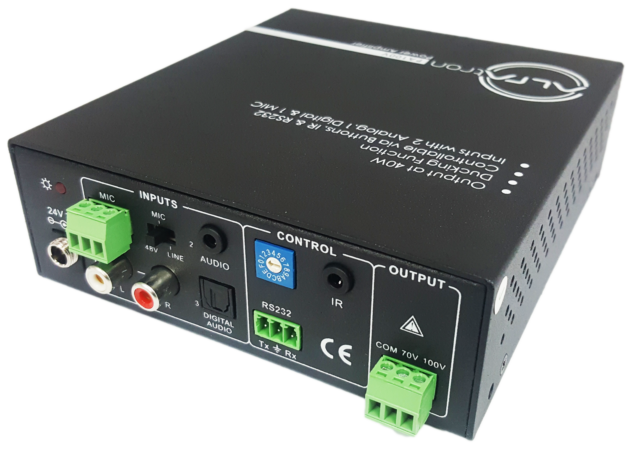 Two stereo audio inputs and one digital audio input, switchable by button, IR remote & RS232. Volume/Bass/Treble controllable by buttons, IR remote & RS232. Fast switching speed for good performance. Convection cooler, fan is not needed. LED indicator, for power and working status. Antistatic case design to provide good protection for long-term and stable performance. 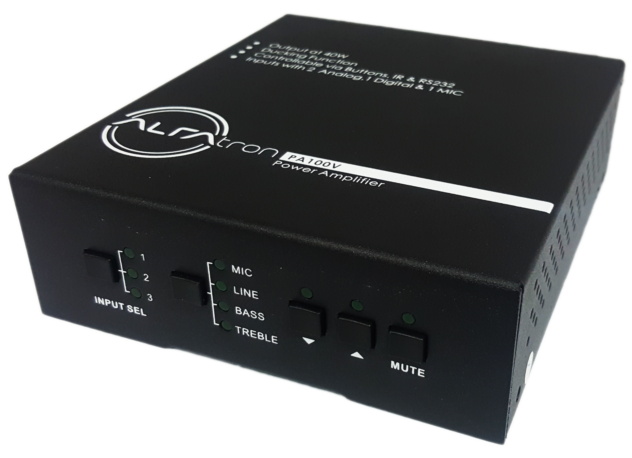 ALFAtron is a South African signal management company aiming at providing the best AV signal management in Africa. @2018 Alpha Technologies . All rights reserved.